After being officially discovered by Clyde Tombaugh in 1930, Pluto spent close to a century being thought of as the ninth planet of our Solar System. In 2006, it was reclassified as a “dwarf planet” due to the discovery of other Trans-Neptunian Objects (TNOs) of comparable size. However, that does not change its significance in our galaxy. In addition to being the largest TNO, it is the largest and second-most massive dwarf planet of our Solar System. As a result, a great deal of time and study has been devoted to this former planet. And with the successful flyby of the New Horizons mission this month, we finally have a clear picture of what it looks like. As scientists pour over the voluminous amounts of data being sent back, our understanding of this world at the edge of our Solar System has grown by leaps and bounds. The existence of Pluto was predicted before it was observed. In the 1840s, French mathematician Ubrain Le Verrier used Newtonian mechanics to predict the position of Neptune (which had not yet been discovered) based on the perturbation of Uranus. By the late 19th century, subsequent observations of Neptune led astronomers to believe that a planet was perturbing its orbit as well. In 1906, Percival Lowell – an American mathematician and astronomer who founded the Lowell Observatory in Flagstaff, Arizona, in 1894 – initiated a project to locate “Planet X”, the possible ninth planet of the Solar System. Unfortunately, Lowell died in 1916 before a confirmed discovery was made. 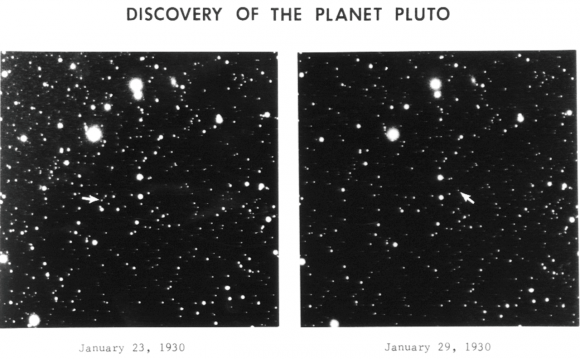 But unbeknownst to him, his surveys had captured two faint images of Pluto (March 19th and April 7th, 1915), which were not recognized for what they were. After Lowell’s death, the search did not resume until 1929, at which point the director of the Lowell Observatory (Vesto Melvin Slipher) entrusted the job of locating Planet X to Clyde Tombaugh. A 23 year-old astronomer from Kansas, Tombaugh spent the next year photographing sections of the night sky and then analyzing the photographs to determine if any objects had shifted position. On February 18th, 1930, Tombaugh discovered a possible moving object on photographic plates taken in January of that year. After the observatory obtained further photographs to confirm the existence of the object, news of the discovery was telegraphed to the Harvard College Observatory on March 13th, 1930. The mysterious Planet X had finally been discovered. After the discovery was announced, the Lowell Observatory was flooded with suggestions for names. The name Pluto, based on the Roman god of the underworld, was proposed by Venetia Burney (1918–2009), a then eleven-year-old schoolgirl in Oxford, England. She suggested it in a conversation with her grandfather who passed the name on to astronomy professor Herbert Hall Turner, who cabled it to colleagues in the United States. The object was officially named on March 24th, 1930, and it came down to a vote between three possibilities – Minerva, Cronus, and Pluto. Every member of the Lowell Observatory voted for Pluto, and the name was announced on May 1st, 1930. The choice was based on part on the fact that the first two letters of Pluto – P and L – corresponded to the initials of Percival Lowell. The name quickly caught on with the general public. In 1930, Walt Disney was apparently inspired by it when he introduced a canine companion for Mickey Mouse named Pluto. In 1941, Glenn T. Seaborg named the newly created element plutonium after Pluto. This was in keeping with the tradition of naming elements after newly discovered planets – such as uranium, which was named after Uranus; and neptunium, which was named after Neptune. With a mass of 1.305±0.007 x 1o²² kg – which is the equivalent of 0.00218 Earths and 0.178 Moons – Pluto is the second most-massive dwarf planet and the tenth-most-massive known object directly orbiting the Sun. It has a surface area of 1.765×107 km, and a volume of 6.97×109 km3. Pluto has a moderately eccentric and inclined orbit, which ranges from 29.657 AU (4.4 billion km) at perihelion to 48.871 AU (7.3 billion km) at aphelion. This means that Pluto periodically comes closer to the Sun than Neptune, but a stable orbital resonance with Neptune prevents them from colliding. Pluto has an orbital period of 247.68 Earth years, meaning it takes almost 250 years to complete a single orbit of the Sun. Meanwhile, its rotation period (a single day) is equal to 6.39 Earth days. Like Uranus, Pluto rotates on its side, with an axial tilt of 120° relative to its orbital plane, which results in extreme seasonal variations. At its solstices, one-fourth of its surface is in continuous daylight, whereas another fourth is in continuous darkness. With a mean density of 1.87 g/cm3, Pluto’s composition is differentiated between an icy mantle and a rocky core. The surface is composed of more than 98% nitrogen ice, with traces of methane and carbon monoxide. The surface is very varied, with large differences in both brightness and color. A notable feature is a large, pale area nicknamed the “Heart”. Scientists also suspect that Pluto’s internal structure is differentiated, with the rocky material having settled into a dense core surrounded by a mantle of water ice. The diameter of the core is believed to be approximately 1700 km, 70% of Pluto’s diameter. Thanks to the decay of radioactive elements, it is possible that Pluto contains a subsurface ocean layer that is 100 to 180 km thick at the core–mantle boundary. Pluto has five known satellites. The largest, and closest in orbit to Pluto, is Charon. This moon was first identified in 1978 by astronomer James Christy using photographic plates from the United States Naval Observatory (USNO) in Washington, D.C. Beyond Charon lies the four other circumbinary moons – Styx, Nix, Kerberos, and Hydra, respectively. Nix and Hydra were discovered simultaneously in 2005 by the Pluto Companion Search Team using the Hubble Space Telescope. The same team discovered Kerberos in 2011. The fifth and final satellite, Styx, was discovered by the New Horizons spacecraft in 2012 while capturing images of Pluto and Charon. Charon, Styx and Kerberos are all massive enough to have collapsed into a spheroid shape under their own gravity. Nix and Hydra, meanwhile, are oblong in shape. The Pluto-Charon system is unusual, since it is one of the few systems in the Solar System whose barycenter lies above the primary’s surface. In short, Pluto and Charon orbit each other, causing some scientists to claim that it is a “double-dwarf system” instead of a dwarf planet and an orbiting moon. In addition, it is unusual in that each body is tidally locked to the other. Charon and Pluto always present the same face to each other; and from any position on either body, the other is always at the same position in the sky, or always obscured. This also means that the rotation period of each is equal to the time it takes the entire system to rotate around its common center of gravity. In 2007, observations by the Gemini Observatory of patches of ammonia hydrates and water crystals on the surface of Charon suggested the presence of active cryo-geysers. This would seem indicate that Pluto does have a subsurface ocean that is warm in temperature, and that the core is geologically active. Pluto’s moons are believed to have been formed by a collision between Pluto and a similar-sized body early in the history of the Solar System. The collision released material that consolidated into the moons around Pluto. From 1992 onward, many bodies were discovered orbiting in the same area as Pluto, showing that Pluto is part of a population of objects called the Kuiper Belt. This placed its official status as a planet in question, with many asking whether Pluto should be considered separately or as part of its surrounding population – much as Ceres, Pallas, Juno and Vesta, which lost their planet status after the discovery of the Asteroid Belt. 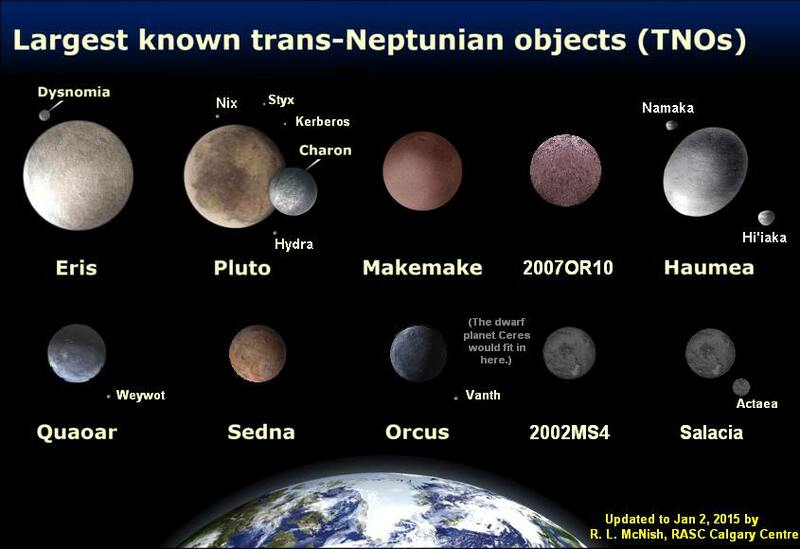 On July 29h, 2005, the discovery of a new Trans-Neptunian Object (TNO), Eris, was announced, which was thought to be substantially larger than Pluto. Initially referred to the as the Solar System’s “tenth planet”, there was no consensus on whether or not Eris constituted the planet. What’s more, others in the astronomic community considered its discovery the strongest argument for reclassifying Pluto as a minor planet. The debate came to a head on August 24th, 2006 with an IAU resolution that created an official definition for the term “planet”. According to the XXVI General Assembly of the International Astronomical Union, a planet must meet three criteria: it needs to be in orbit around the Sun, it needs to have enough gravity to pull itself into a spherical shape, and it needs to have cleared its orbit of other objects. Pluto fails to meet the third condition, because its mass is only 0.07 times that of the mass of the other objects in its orbit. The IAU further decided that bodies that do not meet criterion 3 would be called dwarf planets. On September 13th, 2006, the IAU included Pluto, and Eris and its moon Dysnomia, in their Minor Planet Catalog. The IAUs decision was met with mixed reactions, especially from within the scientific community. For instance, Alan Stern, the principal investigator with NASA’s New Horizons mission to Pluto, and Marc W. Buie – an astronomer with the Lowell Observatory – have both openly voiced dissatisfaction with the reclassification. Others, such as Mike Brown – the astronomer who discovered Eris – have voiced their support. On August 14th – 16th, 2008, in what came to be known as “The Great Planet Debate“, researchers on both sides of the issue gathered at Johns Hopkins University Applied Physics Laboratory. Unfortunately, no scientific consensus was reached; but on June 11th 2008, the IAU announced in a press release that the term “plutoid” would henceforth be used to refer to Pluto and other similar objects. Pluto presents significant challenges for spacecraft because of its small mass and great distance from Earth. In 1980, NASA began to contemplate sending the Voyager 1 spacecraft on a flyby of Pluto. However, the controllers opted instead for a close flyby of Saturn’s moon Titan, resulting in a trajectory incompatible with a Pluto flyby. Voyager 2 never had a plausible trajectory for reaching Pluto, but it’s flyby Neptune and Triton in 1989 led scientists to once again begin contemplating a mission that would take a spacecraft to Pluto for the sake of studying the Kuiper Belt and Kuiper Belt Objects (KBOs). This led to the formation of the Pluto Kuiper Express mission proposal, and NASA instructing the JPL to being planning for a Pluto, Kuiper Belt flyby. By 2000, the program had been scrapped due to apparent budget concerns. After much pressure had been brought to bear by the scientific community, a revised mission to Pluto, dubbed New Horizons, was finally granted funding from the US government in 2003. New Horizons was launched successfully on January 19th, 2006. From September 21st-24th, 2006, New Horizons managed to capture its first images of Pluto while testing the LORRI instruments. These images, which were taken from a distance of approximately 4,200,000,000 km (2.6×109 mi) or 28.07 AU and released on November 28th, confirmed the spacecraft’s ability to track distant targets. 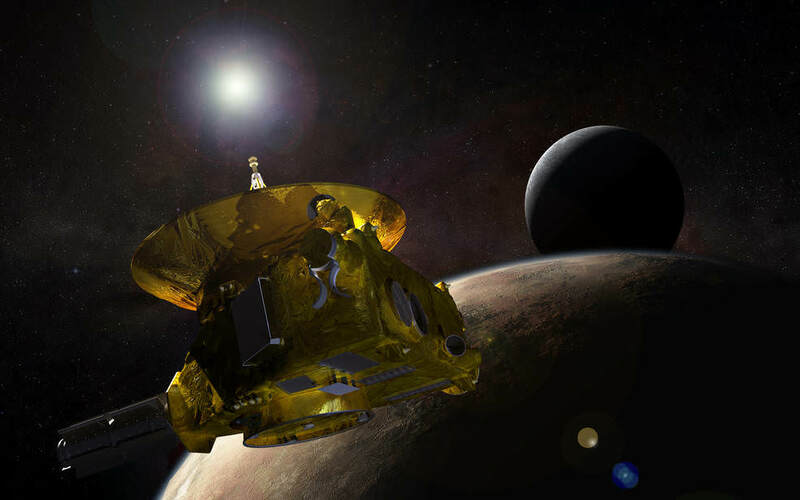 Distant-encounter operations at Pluto began on January 4th, 2015. Between January 25th to 31st, the approaching probe took several images of Pluto, which were released by NASA on February 12th. These photos, which were taken at a distance of more than 203,000,000 km (126,000,000 mi) showed Pluto and its largest moon, Charon. The New Horizons spacecraft made its closest approach to Pluto at 07:49:57 EDT (11:49:57 UTC) on July 14th, 2015, and then Charon at 08:03:50 EDT (12:03:50 UTC). Telemetries confirming a successful flyby and the health of the spacecraft reached Earth on 20:52:37 EDT (00:52:37 UTC). During the flyby, the probe captured the clearest pictures of Pluto to date, and full analyses of the data obtained is expected to take years to process. The spacecraft is currently traveling at a speed of 14.52 km/s (9.02 mi/s) relative to the Sun and at 13.77 km/s (8.56 mi/s) relative to Pluto. Though the New Horizons mission has shown us much about Pluto – and will continue to do so as scientists pour over all the data collected by the probe’s instruments – we still have much to learn about this distant and mysterious world. In time, and with more missions to the outer Solar System, we may eventually be able to unlock some of its deeper mysteries. Until then, we offer all information that is currently available on Pluto. We hope that you find what you are looking for in the links below and, as always, enjoy your research! How Many Miles is Pluto from the Sun? Who Was Pluto Named After? In two new paper published this week, scientists at the Complutense University of Madrid and the University of Cambridge noted that the most accepted theory of trans-Neptunian objects is that they should orbit at a distance of about 150 AU, be in an orbital plane – or inclination – similar to the planets in our Solar System, and they should be randomly distributed.